Write for Growth’s New Year, New Journal Workshop at Gladstone’s Library on a January Saturday always draws a full house. We gathered to explore fresh angles on journalling our way through 2019. Making space to write is one thing, but once we’ve done that, we can find another gap – between our desire to write and actually putting words on a page. Closing that gap can be a challenge for every writer. Some pointers from our morning may help us on our way. Journalling prompts abound, but the best writing prompts may be the ones we generate for ourselves. The possibilities are endless as we pay attention to the world around us: an overheard remark; something observed on an outdoor walk; a triggered memory; a quote we’ve read; a question that bothers us. If something has caught our attention, it has done so for a reason. Something external has connected to an internal response, and there is likely to be some fruitful writing material at the join. Write about what you notice, and see where words take you. The feeling that our writing is not ‘good enough’ can come from many sources, from our own innate perfectionism to discouraging experiences in our school-days. But when it comes to our personal writing, we cannot write the wrong thing. Especially as what we write can be for our eyes only. In journalling, we give ourselves permission to enjoy writing as we can, not as we cannot. The page is there for us to express ourselves and grow in writing capacity and confidence at our own pace. One writing technique that groups often enjoy using is that of the Captured Moment. Unlike a diary, where you may feel you have to record every activity, journalling enables you to be more selective and focus on what matters to you. Look back over your day, and pick out your key moment – whatever holds most significance for you personally. 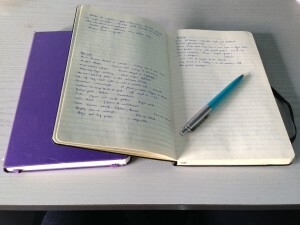 Journalling author Helen Cepero suggests that the ‘heart of the day’ is likely to be a moment that links to some experience of emotion. Set yourself to re-evoking this experience on the page, in as much sensory and emotional detail as you can. You may also find it helpful to note what made this moment so important for you. Journal-writing can be most effective as you reflect on what you have written. Once words have left your pen and appeared on the page, your perspective on what they contain as you re-read them will already be different. You may still have the issue you have written about, but it no longer has you. Whether you re-read your writing immediately or after a cooling off period, returning to it at some point can help you get the most out of it. What do you notice as you read? And what do you want to do with what you notice? It can also be helpful to look back at journal entries over a longer period and see if you can spot any emerging patterns or themes. On our morning, we picked up on an exercise originated by Amber Lea Starfire on the theme of motivation. We listed those things we did easily; the ones we had to push ourselves to do, and the ones we aspired to do but never actually got round to. We discovered that we were more motivated to tackle tasks that we could finish and which gained us some immediate, positive feedback. Our aspirations list left us uncertain and overwhelmed at the size of the tasks facing us, and understandably reluctant to start. We looked at ways of harnessing motivators from the easy list to get us going on our aspirational one: breaking things down into sections; exploring how we could reward step-by-step progress. Making things more manageable can give us some momentum, but ultimately any aspiration worth its salt – writing included – needs to take us beyond our comfort zone to come to full flower. Write for Growth at Gladstone’s Library in March will pick up on this a little more with its theme of Borders. Do get in touch if you’d like to join us. This entry was posted in Blog Posts, Creative Writing, Writing for Wellbeing and tagged Amber Lea Starfire, Captured Moment, Helen Cepero, journalling, Write for Growth, writing for well-being. Bookmark the permalink. Post a comment or leave a trackback: Trackback URL.